Over 6,000 Spirolox® Rings are stocked in 302 and 316 stainless steel from 1/4" to 16" diameters. Customs can be manufactured from .200" to 120". Smalley's manufacturing process allows for the economical production of stainless steel rings. Free samples are available of stock parts to test in your application. Software: SOLIDWORKS 2015 is here! The new FAULHABER IEH2-4096 integrated encoder offers higher resolution, an expanded operating temperature range and improved speed control, especially in the low speed range. The new model lengthens the motor by just 1.4 mm and can be combined with numerous precious metal commutated DC micro motors. Because these are used in very small machines and assemblies, size plays a decisive role. Researchers from North Carolina State University have developed a technique for controlling the surface tension of liquid metals by applying very low voltages, opening the door to a new generation of reconfigurable electronic circuits, antennas, and other technologies. The metals can transform from a sphere to a pancake, for example, and back again on command. 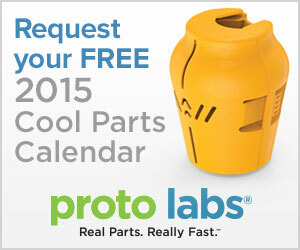 Designed by designers and engineered for engineers, get your Cool Parts Calendar 2015. U.S. Army researchers at the Aviation and Missile Research, Development and Engineering Center (AMRDEC) at Redstone Arsenal, AL, are engineering technology solutions to enable improved lethality and fires -- and build the Army of 2025 and beyond. 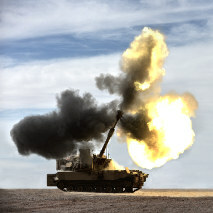 Fire support includes mortars, field artillery, air defense artillery, naval and air-delivered weapons. For all of their trumpeted efficiency, did you know that only 2 to 4 percent of the light generated by a standard LED escapes from inside the device? Wow, either did we! With all that trapped light energy, no wonder they get hot. But Princeton University researchers are onto something big to change this, including a 57 percent improvement in brightness and efficiency. Think aluminum is the key to lightweighting automobiles and creating efficiencies in the future? Mercedes-Benz doesn't -- at least not for pistons. The company is switching to a high-strength steel piston design for a future line of its diesel passenger-car engines. If your vision of the future is 3D printing your own high-hardness steel bearings right at your location on demand, your wish has been granted. A new development from the NanoSteel Company supports the market need for on-demand, on-site wear parts while addressing the current challenges in 3D printing of high-hardness parts. 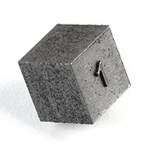 NanoSteel's uniform, engineered steel powder matrix material overcomes one of the major hurdles to achieving a high-hardness metallic part through additive manufacturing: the tendency to develop cracks during part builds. The company worked with a global process development partner to successfully produce via laser sintering a fully dense (99.9 percent) crack-free part with hardness values over 1,000 HV and wear resistance comparable to conventionally manufactured M2 tool steels. That's more dense than most castings! Click here to learn more about NanoSteel. NASA has completed a complex series of tests on one of the largest composite cryogenic fuel tanks ever manufactured, bringing the aerospace industry much closer to designing, building, and flying lightweight composite tanks on rockets. 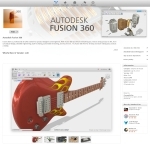 Autodesk Fusion 360 -- a cloud-based tool that combines 3D industrial and mechanical design, collaboration, and machining in a single package -- is the first solution of its kind available for purchase worldwide on the Mac App Store. Available for PCs too, Fusion 360 lets designers and engineers create products that have both form and function and prepare them for fabrication with one single tool. As a result, users can explore product ideas quickly and get a prototype faster. Fusion 360 also provides a single space for entire teams to collaborate on projects. With SOLIDWORKS 2015, users gain access to cloud-based capabilities and a wider range of choices for improving productivity, work processes, and operating costs. SOLIDWORKS 2015 covers all comprehensive aspects of the product development process with an intuitive, integrated 3D development environment that includes 3D design, simulation, electrical design, product data management, and technical communication. In addition, starting with the new Collaborative Sharing feature, SOLIDWORKS 2015 enables access to Dassault Systemes' 3DEXPERIENCE platform and its cloud-based capabilities. Step-Flex, the new class of shaft couplings from Miki Pulley US, eliminates resonance in stepper motor ball screw assemblies. 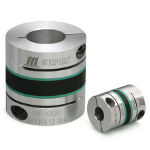 This two-part elastomer-element coupling features an innovative combination of HNBR (black) rubber element flanked by smaller, softer laminated (green) spacers designed to "mechanically tune" the system for optimal performance when a stepper motor is used to drive a linear actuator. This unique design quickly dampens oscillations, thereby suppressing resonance. The coupling's machined aluminum hubs also provide a low moment of inertia. Thomson Industries has expanded its range of high-performance, miniaturized components with the launch of several new products. The new precision TSI Rolled Ball Screws offer high load capacity, smoothness, and quiet operation that can be easily customized. Thomson Miniature Metric Ball Bushing Bearings offer smooth and rapid operation in a light, compact package, lasting up to 27 times longer than conventional linear bearings. The mini Glide Screw combines the best features of linear bearings and linear guides into an easy-to-install, one-part solution that requires no external guides and delivers the ultimate in compact design. For the first time using a water-based solution, researchers at the University of Missouri have created a long-lasting and more efficient nuclear battery that could be used for many applications such as a reliable energy source in automobiles and emergency equipment, and also in complicated applications such as space flight. Contract manufacturer LEAX Group was looking for a modern automation solution for constantly changing workflows: The robots had to be flexible, easy to program, space efficient and with a sufficient payload. The answer was UR10 robotic arms from Universal Robots. Watch the robot in action solving agile manufacturing tasks here.